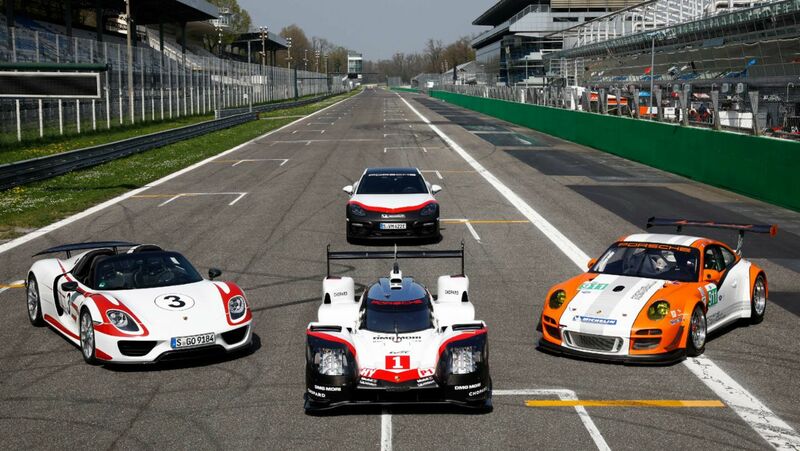 Porsche has gathered its most powerful hybrid models in one place for the first time. The future of sports cars is electrifying: With the 911 GT3 R Hybrid and the 919 Hybrid, a two-time winner at Le Mans, Porsche has proven this both on the race track and with its series-production models. With the launch of the 652 kW (887 hp) 918 Spyder in 2013, Porsche announced a new era of super sports cars: In addition to a 4.6 litre eight-cylinder engine, it also had two electric motors. Together, the powertrain units allowed for breathtaking driving performance. With the new Panamera Turbo S E-Hybrid, Porsche has once again set a new course. For the first time, a plug-in hybrid vehicle represents the top of its model line. Already, the first four-seater sports car in the history of Porsche to have a purely electric powertrain is on the horizon, and is due to be launched before the end of the decade. The Mission E concept study, which Porsche presented at the Frankfurt IAA 2015, provided the blueprint for this project. The hybrid performance pioneers emphasise the great importance of electrification; at Porsche, innovation is a tradition. Porsche views this new type of “E-Performance” – more power, more driving enjoyment, lower fuel consumption and reduced exhaust emissions – as the performance kit of the future. From the very beginning, Porsche saw hybrid technology not only as essential to sustainable mobility, but also as a particularly high form of efficiency. In as early as 1899, Ferdinand Porsche designed the Lohner-Porsche “Mixte”. With its combination of battery-powered electric drive and a combustion engine, it is considered to be the world’s first standard hybrid car. In 2010, Porsche returned to the visionary “Mixte” drive concept. The sports car manufacturer once again used the race track as a test laboratory and, after more than 20,000 victories, opened a new chapter in the extraordinarily successful motorsports history of the Porsche 911 with the 911 GT3 R Hybrid. The hybrid system developed specifically for use in the 911 GT3 R test vehicle differed significantly from traditional concepts at that time. A front-axle drive with two electric motors that each provided 60 kW (82 hp) supplemented the 480 hp and 4.0 litre six-cylinder flat engine in the rear. In the Evo version introduced in 2011, each of the two permanently activated synchronous motors contributed 75 kW (102 hp). In braking phases the electric units reversed their function and worked as generators. As a result, they regained kinetic energy that otherwise would have been dispersed as waste heat. So, for the first time in motor racing it can be said: Whoever brakes, wins. The recuperated energy drove a mechanical flywheel energy storage system in the form of another electric motor which – together with other hybrid components – was located in a carbon-fibre safety cell in the passenger space. The system was designed and manufactured by Williams Hybrid Power according to Porsche’s specifications, and achieved rotation speeds of 40,000 rpm. If the driver called up the energy saved there, for example for additional acceleration thrust or overtaking manoeuvres, the flywheel was electromagnetically decelerated in generator mode. As a result, the two electric motors on the front axle initially received enough current to provide additional power of 120 kW (163 hp), and 150 kW (204 hp) from 2011, for up to eight seconds. As a result, the 911 GT3 R Hybrid was temporarily transformed into an all-wheel drive vehicle. 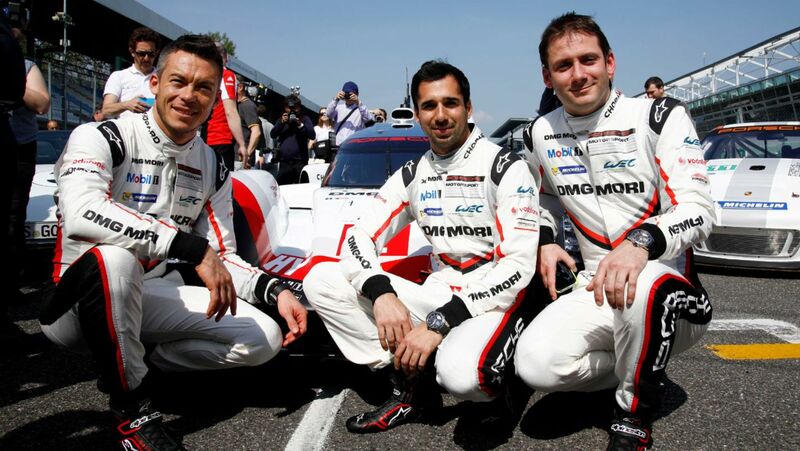 Depending on the racing situation, Porsche could use the hybrid drive to improve either performance or consumption. This made it possible for strategists to choose between a lower tank weight or more laps between two pit stops. 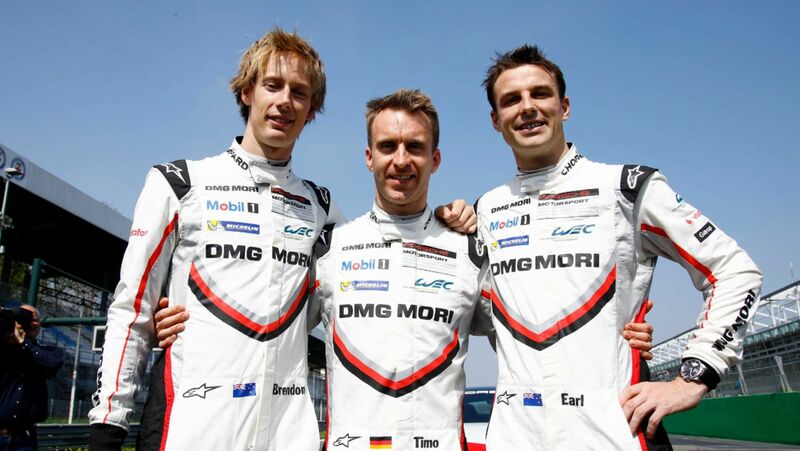 Although a victory by the 911 GT3 R Hybrid at the 24-hour race on the Nürburgring was not the primary goal, the innovative technology champion almost succeeded in doing this at its premiere in 2010. The orange-white 911 GT3 R Hybrid retired after 22 hours and 15 minutes with a mechanical defect in the combustion engine. 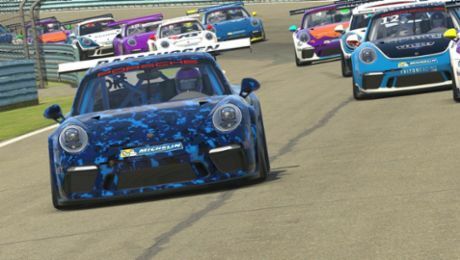 At this time, it had been defending its lead for eight hours, proving that the hybrid technology developed by Porsche is extremely competitive on the race track and represents a significant advantage in the sense of “Porsche Intelligent Performance”. In the same year, the 911 GT3 R Hybrid completed the endurance races in Road Atlanta (USA) and Zhuhai (China) without any problems. During the 24 Hours of Nürburgring in 2011, the hybrid racing car experienced interim problems in its mechanical drive, but was then able to catch up and cross the finish line in 28th place. With the hybridised 918 Spyder, in 2013 Porsche announced a development that in this decade will lead to the brand's first purely electrically driven sports car, introducing a new era. The 918 Spyder offers high performance on the race track, but can also glide through the city exhaust-free and virtually without a sound. Thanks to its advanced plug-in hybrid design, it combines a system performance of 652 kW (887 hp) with a top speed of 345 km/h and an NEDC average fuel consumption of 3.1 litres/100 km. In 2013, the 918 Spyder became the first series-production sports car to break the seven-minute barrier on the Nürburgring Nordschleife. Its record lap time of 6.57 minutes was due, among other factors, to the additional thrust of its two electric motors and the power hybrid knowledge that Porsche had previously gained with the 911 GT3 R Hybrid. A special feature of the two-seat standard super sports car is its three independent engines. They can be controlled individually, and set the stage for a unique all-wheel drive concept by exploiting all the possibilities of the combined drive. A 4.6 litre and 447 kW (608 hp) high-revving V8 engine forms the basis of the concept. By means of a dry decoupler, it connects directly to a parallel-switched electric motor with 115 kW (156 hp). Both can power the rear axle either individually or jointly via a seven-speed Porsche Doppelkupplung (PDK). If no drive power is needed, the motors can be completely decoupled at speeds of up to 150 km/h. This allows for the typical Porsche “coasting” with the combustion engine switched off. The second electric drive operates mechanically, independently of the rear axle. The permanently activated synchronous motor with internal rotor is small, light and combines a maximum engine speed of 16,000 rotations per minute with high performance development. Via a transmission with a constant gear ratio, it sends up to 95 kW (129 hp) to the front wheels. This means that the 918 has a temporary all-wheel drive that improves traction and offers advantages in terms of driving dynamics. The front electric motor decouples via an integrated claw clutch only above speeds of approximately 265 km/h. As a result the electric all-wheel drive function is available at practically any time. In addition to boosting, both electric units can also regain energy. This electrical current is stored by lithium-ion batteries with a capacity of 6.8 kWh. Placed diagonally in the monocoque floor behind the seats, they are distinguished by special individual cells. As is typical for plug-ins, they can also be charged on a plug socket with the on-board alternating charger in a maximum of 3.8 hours or via the optional direct current fast-charging station from Porsche in 25 minutes. The experiences with the 911 GT3 R Hybrid and the 918 Spyder also influenced the development of the Porsche 919 Hybrid. With it, the sports car brand returned to the top class of the World Endurance Championship (WEC) in 2014, and therefore also to the 24 Hours of Le Mans. With system performance of over 900 hp (662 kW), the 919 Hybrid, which was developed from the ground up and is extremely complex, is the fastest test laboratory and the most innovative racing car that Porsche has ever built. From the beginning, its bold technical concept followed a clear objective: Optimum energy efficiency through the greatest possible effectiveness of all the components. This applies equally to the aerodynamics of the Le Mans prototypes and to the uncompromising lightweight construction of all the elements, particularly the energy recovery and drive systems – cutting-edge technologies that are of great importance for use in series-production models. These technologies include the 800-volt technology, which also distinguishes the purely electrically driven Mission E concept vehicle. The series-production version of the four-door sports car study will be launched before the end of the decade. In view of the WEC technical regulations, which were introduced for the first time in 2014 and offer the 919 engineers great freedom for creative solutions, Porsche chose an unusual path: The hybrid drive is based on two different energy recovery systems. The first works relatively conventionally and was derived from the 911 GT3 R hybrid: A generator on the front axle transforms kinetic energy into electrical energy in braking phases. The second is more advanced and even today is unprecedented on the starting grid of the World Sports Car Championship because it accesses the thermodynamic energy of the exhaust gas flow. To do so, an additional turbine generator unit takes on the task of the wastegate: The control valve protects turbo systems from overloads by allowing pressure peaks to dissipate. From this exhaust gas energy, which was previously lost, the unit referred to as the MGU-H (Motor Generator Unit Heat) generates electrical current. 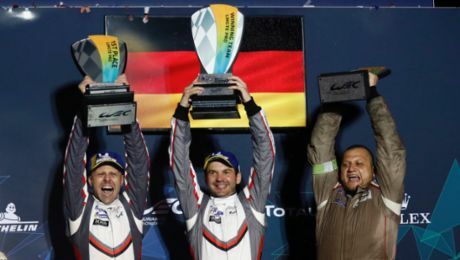 As a result, the Porsche 919 Hybrid is the only sports car in the LMP1-H top class that recovers excess energy not only during braking, but also during acceleration. Regarding the question of the 919 storage medium, the flywheel energy storage system used in the 911 GT3 R Hybrid initially seemed to be the first choice, but Porsche once again pursued a bolder path with an innovative concept: The self-developed, liquid-cooled lithium-ion batteries, which are based on cell technology from the partner company A123 Systems, combine relatively large storage capacity with high power density. Thus they offer the best compromise between fast power consumption and power output. In acceleration phases their energy flows to the front generator, which then functions as a single electric motor and drives both front wheels via a differential. This gives the Porsche 919 Hybrid a temporary all-wheel drive, because the power of the just 2.0 litre four-cylinder V-combustion engine goes to the rear axle alone. A noteworthy point in the LMP1-H regulations of the WEC is that the amount of electrical energy that can be recovered per lap and be re-boosted is limited. 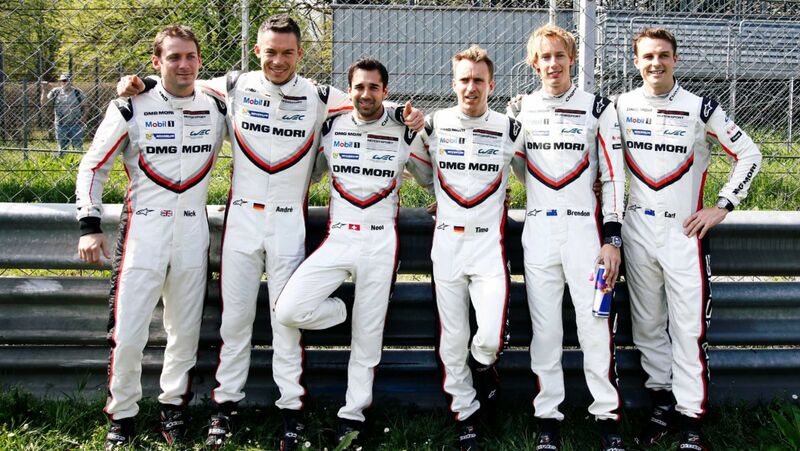 In 2015 the Porsche 919 Hybrid became the first prototype to be launched in the 8-megajoule top category. 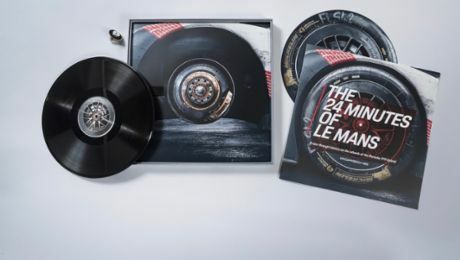 For the 13,629-kilometre long “Circuit des 24 Heures” at Le Mans, this means that the prototype may apply exactly 2.22 kilowatt hours (kWh) of current per lap, and consume the equivalent of 8 MJ (1 MJ = 0.28 kWh) and a maximum of 4.31 litres of petrol. The electrical energy that the Porsche 919 Hybrid recovered at Le Mans in each of the 24-hour races in 2015 and 2016, where it was victorious both years, would be enough to power a single-family home for three months. The newest star in Porsche's power-hybrid ensemble is the Panamera Turbo S E-Hybrid. The four-door saloon celebrated its world premiere at the Geneva Motor Show at the beginning of March, and stands at the peak of its model line. The cooperation of the 4.0 litre V8 engine from the Panamera Turbo with the 100 kW (136 hp) electric motor results in total system power of 500 kW (680 hp; Fuel consumption combined 2.9 l/100 km; CO2 emissions 66 g/km; electricity consumption (combined) 16.2 kWh/100 km) and outstanding power delivery: When just above idle speed, the Panamera Turbo already offers 850 Nm of torque. This allows it to accelerate from zero to 100 km/h in 3.4 seconds and to reach a top speed of 310 km/h. The liquid-cooled, lithium-ion high-voltage battery installed in the rear area has a capacity of 14.1 kWh. Via a 230-volt connection with ten amperes, it is completely charged within six hours. The optional on-board charger with an output of 7.2 kW shortens the charging process to 2.4 hours. As in the Panamera 4 E-Hybrid, the decoupler used in the Porsche hybrid module is actuated electromechanically by an electric clutch actuator (ECA). The advantage of this is the short response time and the high level of comfort. The boost strategy of the all-wheel-drive Panamera, which can travel up to 50 kilometres on electrical power alone, originates from the 918 Spyder super sports car. The Panamera Turbo S E-Hybrid starts in purely electric “E-Power” mode by default. When a pressure point is passed in the accelerator pedal or when the battery charge level drops below a minimum value, the “Hybrid Auto” mode is activated. Then the power of both engines is available. All four Porsche power hybrids prove that this combination of two power sources reconciles performance and efficiency – both on the road and on the race track.